World War I was a conflict with unimaginable death and destruction. How did countries convince people to join the fight and civilians to support the war effort when the world was falling apart around them? In an era where motion pictures were in their infancy, radio was almost unknown, and television was decades in the future, posters were crucial to shaping civilian attitudes towards the war. These posters used colorful, emotion-filled images to get messages quickly and simply to anyone viewing them. World War I was sparked by the assassination of Archduke Franz Ferdinand of Austria in Sarajevo on June 28, 1914. Austria declared war on Serbia a month after the assassination. In the decades leading up to 1914, most European countries entered into alliances promising to defend each other in cases of war. Therefore, Austria and Serbia’s declaration of war led nearly every European country to join the war by late summer and fall of 1914. The war split into two alliances. The Central Powers included Germany, Austria-Hungary, the Ottoman empire, and Bulgaria. Opposing them, the Allied Powers included Great Britain, France, Russia, Belgium, Japan, and the United States. The United States was a late entrant into the war. It joined the Allied Powers in 1917. World War I officially ended in November 1918. Approximately 70 million soldiers fought in World War I. Over 9 million soldiers and 7 million civilians died. Another 23 million were wounded during the four years of combat. 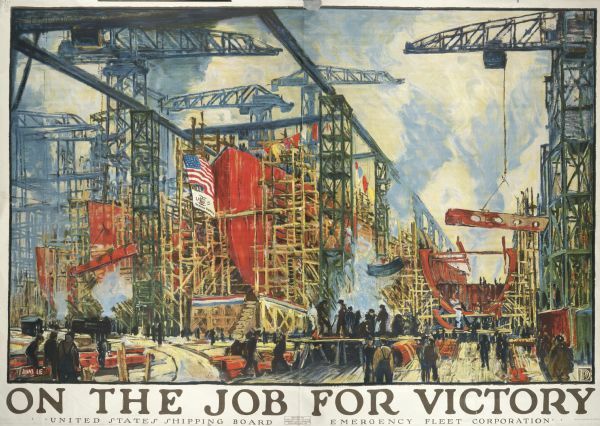 Most countries involved in World War I used posters to inspire and persuade their citizens. The posters generally featured colorful images and catchy slogans appealing to emotions and patriotism. They were designed to capture the eye of busy passersby and to quickly inform and provoke action, ranging from enlisting to fundraising to gardening. Posters were valuable methods of spreading propaganda because they were easy to reproduce and display in a variety of sizes. The same poster could even be printed in multiple languages, including German and Yiddish, which was critical to reaching large immigrant populations in parts of the United States. They were hung in workplaces, taped onto windows in homes, printed in magazines and newspapers, displayed on street car windows and the sides of buildings, and more. The United States created The Committee on Public Information to disseminate propaganda throughout the country. The Division of Pictorial Publicity was an offshoot of the Committee, which focused on posters. Well-known illustrator Charles Dana Gibson (creator of the Gibson Girl drawings) headed the Division. Gibson recruited many prominent illustrators to create posters promoting the war effort. 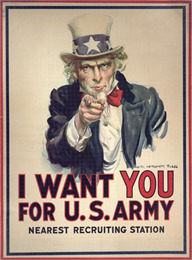 One of those illustrators, James Montgomery Flagg, created one of the most iconic war posters of all time: the image of Uncle Sam pointing to the viewer saying "I want YOU for the U.S. Army." While many posters were designed by well-known artists, the majority were anonymous creations. The United States’ approach to propaganda in World War I mirrored that of its European cousins Great Britain and France. The following are just three examples of themes that appear across the poster collection. The United States army consisted of only 100,000 soldiers at the beginning of 1917. When the US entered World War I, President Wilson wanted to increase the army to 1 million men. 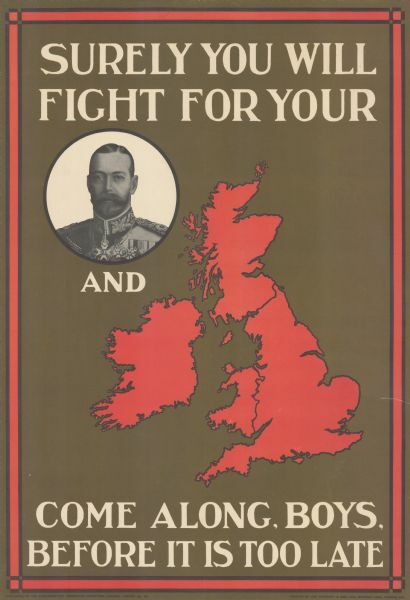 A draft was instituted after only 73,000 men volunteered in the first six weeks of the war. The Selective Service Act of 1917 began in May 1917 and eventually drafted almost 3 million men. Still, the military preferred men as well as women to volunteer for service rather than wait for conscription. Posters were used to inspire men to join the military by appealing to patriotism, hatred for the enemy, adventure, and peer pressure. Women were not allowed into the military, but were encouraged to serve as nurses or in other non-combat roles. World War I cost the US government about $30 billion. In comparison, the federal government only spent $970 million in 1913. The government needed to raise huge amounts of money very quickly. It did so, in part, by selling Liberty Bonds, small loans (i.e. 4% over 25 years) offered by Americans to the government. The first Liberty Bond act was reluctantly received. The government used the full force of its propaganda power to increase participation in the subsequent three acts. 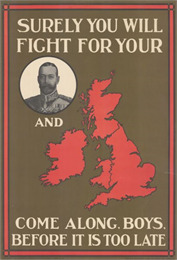 Posters appealed to patriotism, particularly for those unable to fight. Other posters used the enemy as motivation, portraying them as inhuman or reminding viewers of German atrocities. Symbolically, children came to serve several roles in wartime posters. They were the victims of German aggression in need of rescue, both by soldiers and through fundraising. They were adorable little patriots doing their part to help the war effort, by saving wheat or by hanging a Red Cross service flag. And they were part of the home and family life that soldiers could look forward to upon their return.